Todd Scott was a Galveston, Tx native who wasn’t recruited locally- so he went out of the state to Louisiana-Lafayette where he’d make an impact playing football in that tiny community. He’d rank first in career punt return yardage with 553 (10th nationally all time) and played in the Blue-Gray game in 1990. The Vikings, needing to train a protege to veteran Joey Browner took a flyer on the young player in the 6th round of the 1991 draft. Scott started just one game in 1991 and made 33 tackles, but in 1992 he’d start all 16 games after Browner left via free agency, making 5 interceptions and 73 tackles. (These marks would be career highs.) 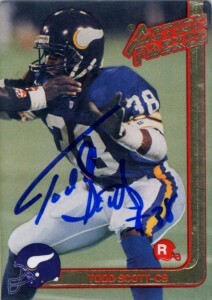 Todd was also named to the Pro Bowl that season as well. In 1994 Scott earned All-Madden team honors, but found himself on the street in 1995, playing for both the New York Jets for 10 games and Tampa Bay for 1 contest. He’d continue to play in Tampa Bay briefly in 1996 and then Kansas City in 1997 where he retired after a few injury plagued years. A really intelligent player in coverage Scott is most well known by Minnesota fans for a pick 6 he made against the Bears in 1992. Scott backed off runningback Neal Anderson to give quarterback Jim Harbaugh the impression that he was going to allow for a big reception out of the backfield. Harbaugh bit, audibled, and Scott returned the interception for 35 yards and a touchdown. Most recently in 2010, Scott was inducted into the Lousiana-Lafayette Ragin’ Cajun’s Hall of Fame.